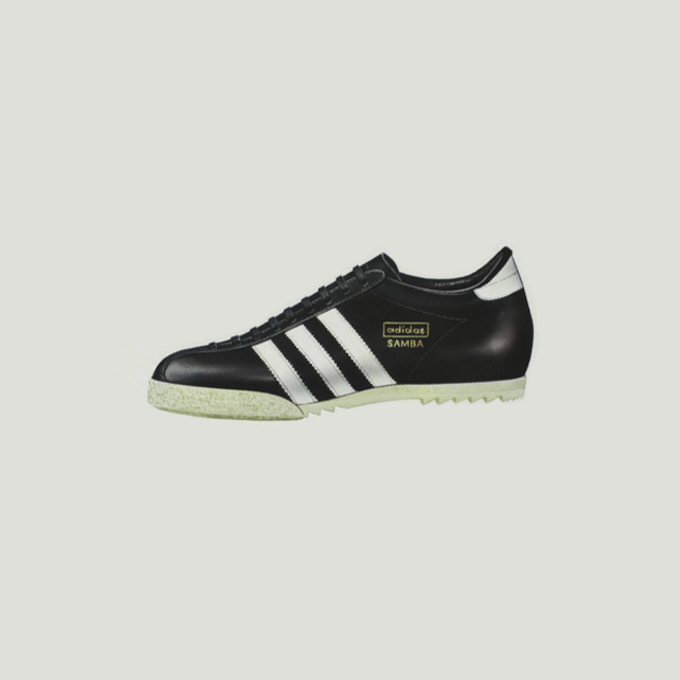 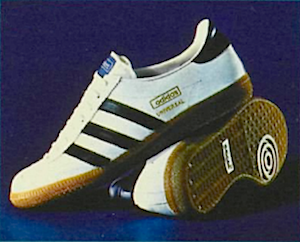 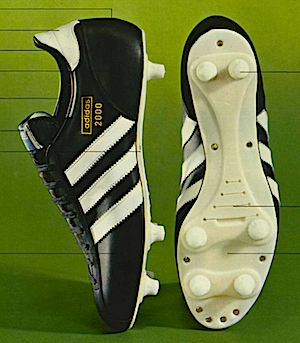 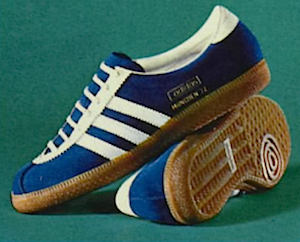 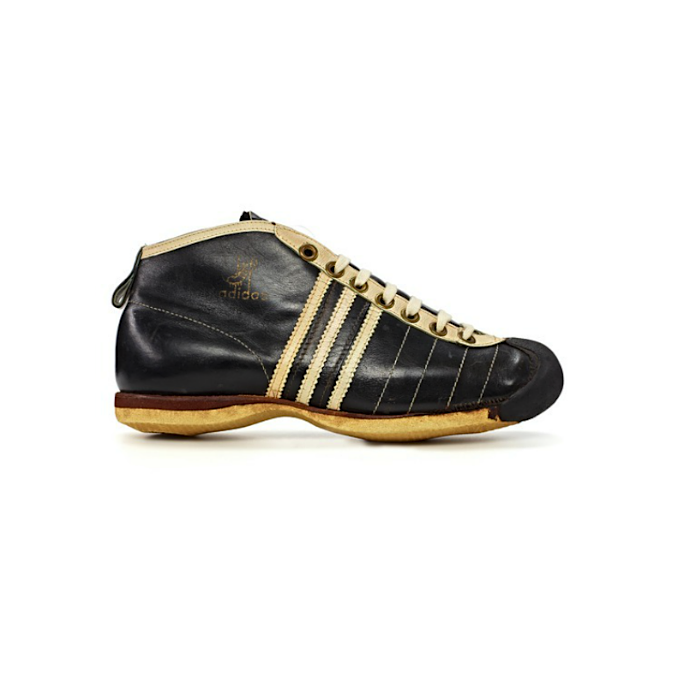 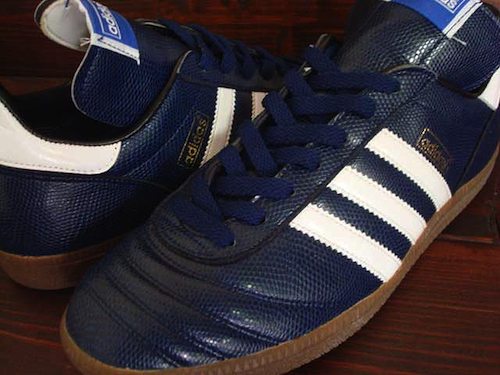 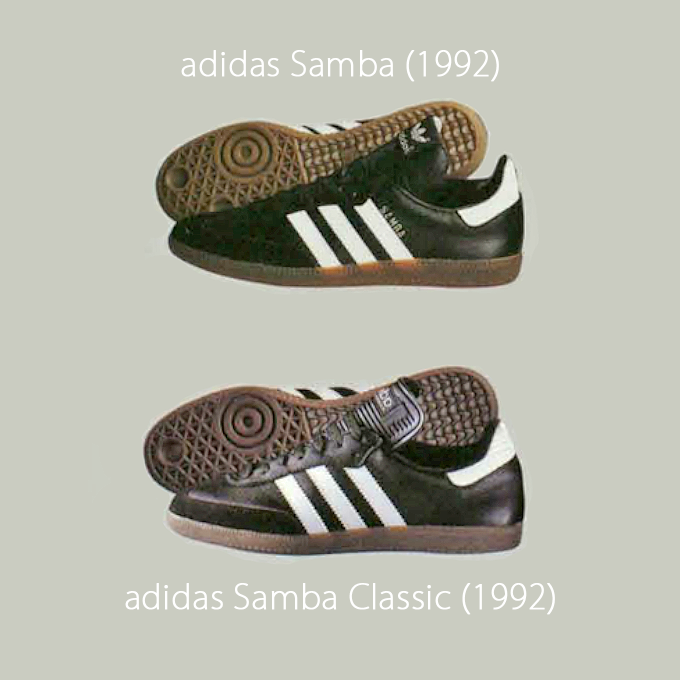 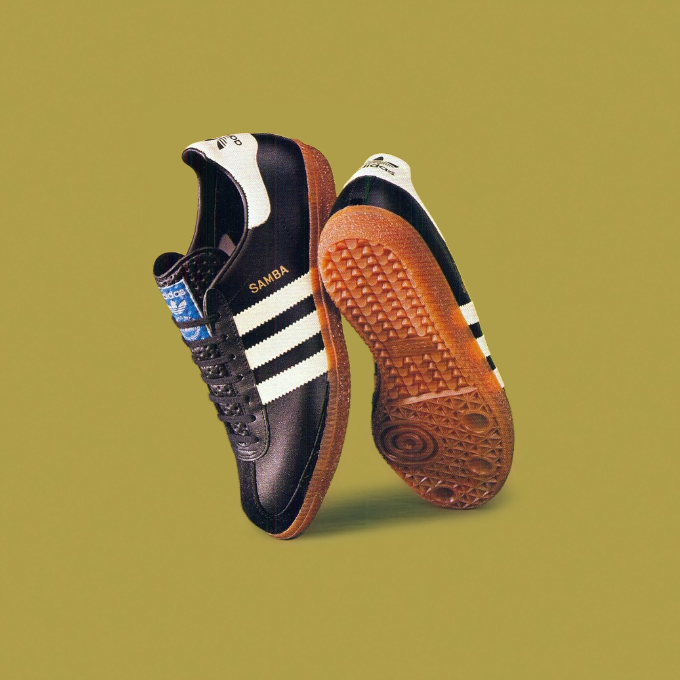 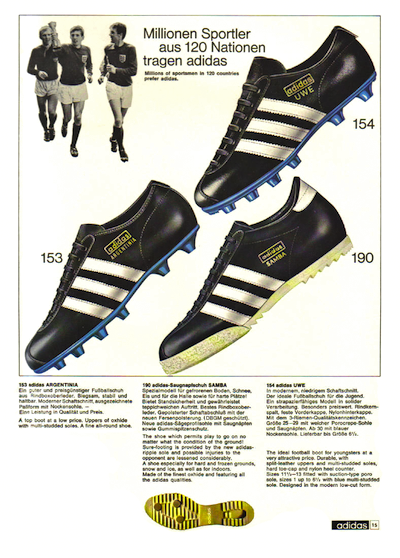 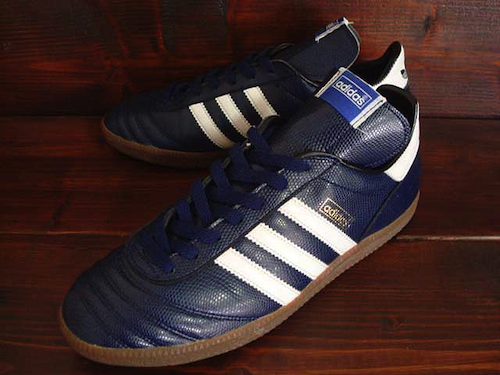 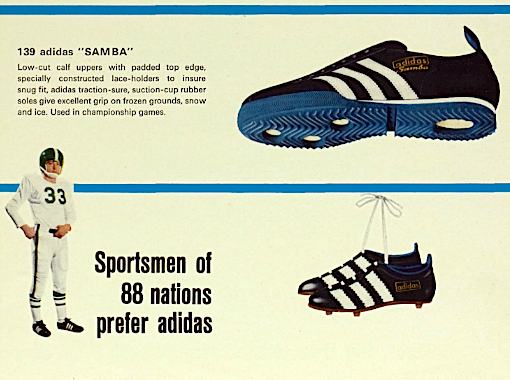 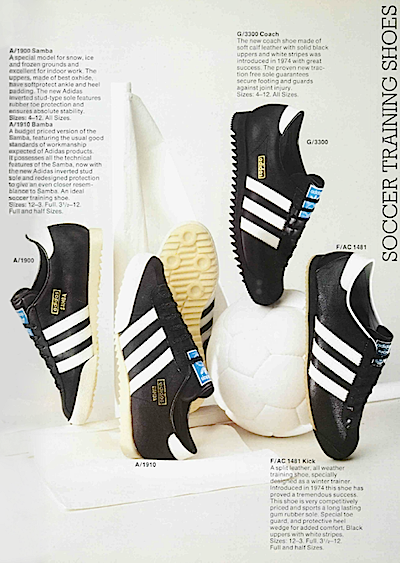 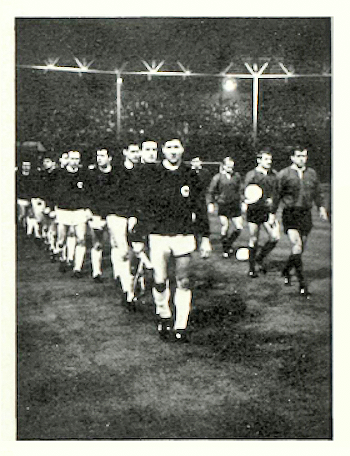 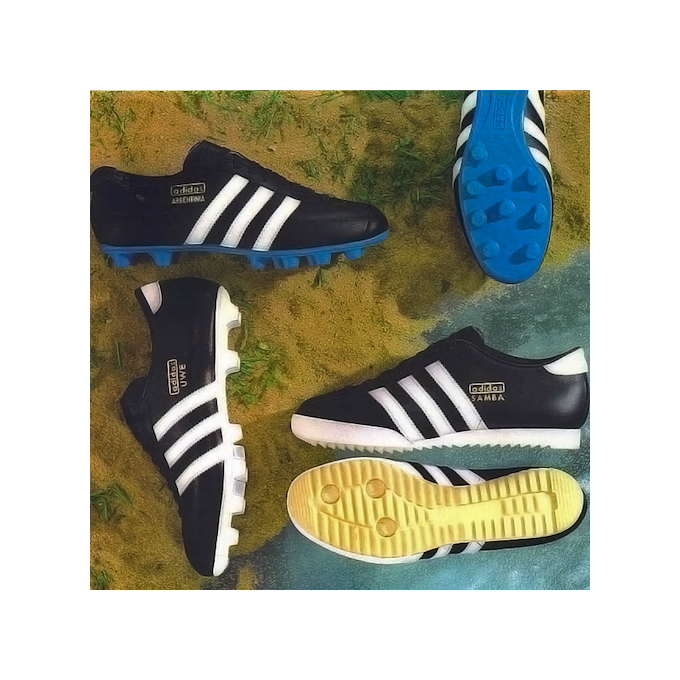 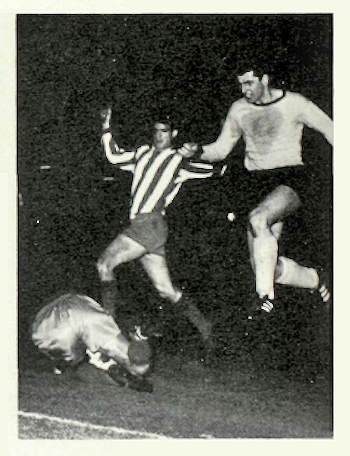 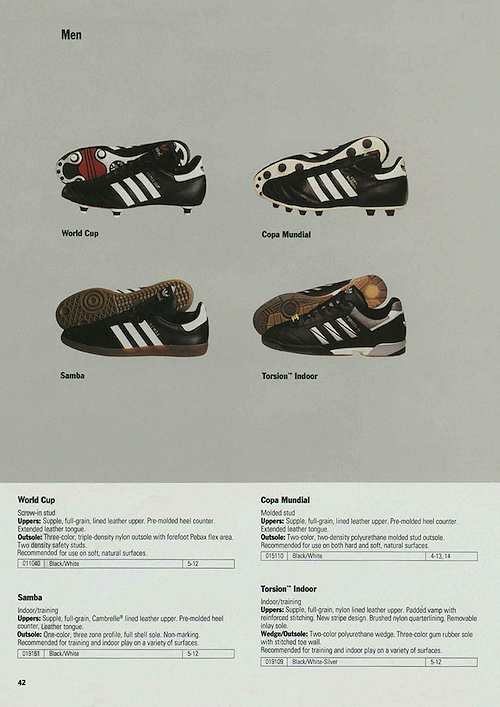 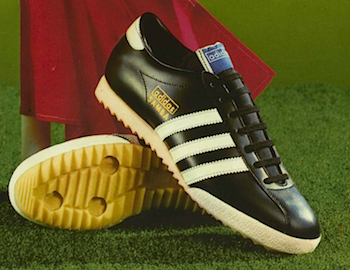 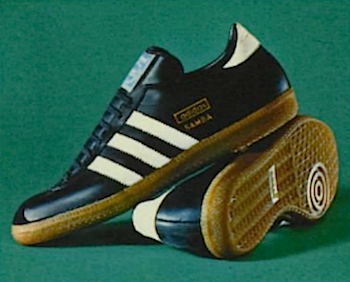 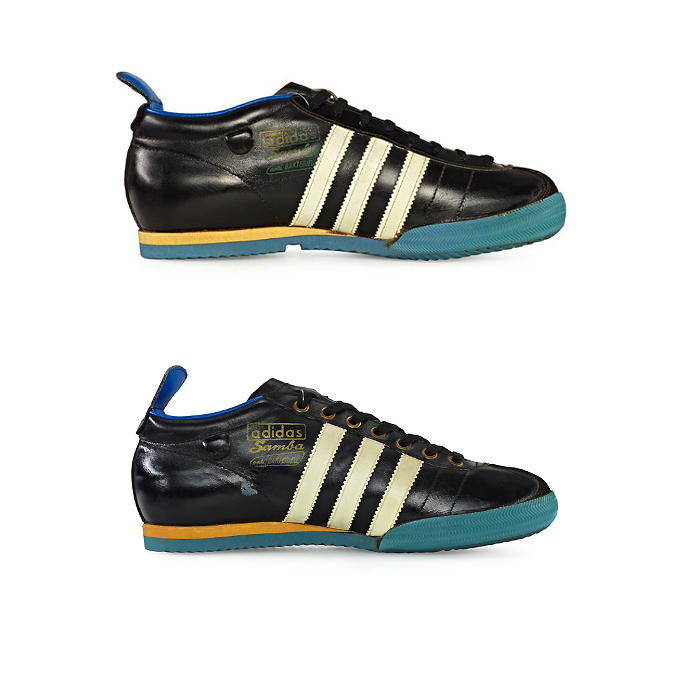 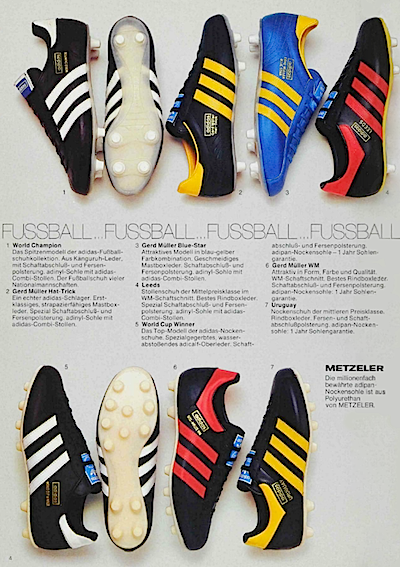 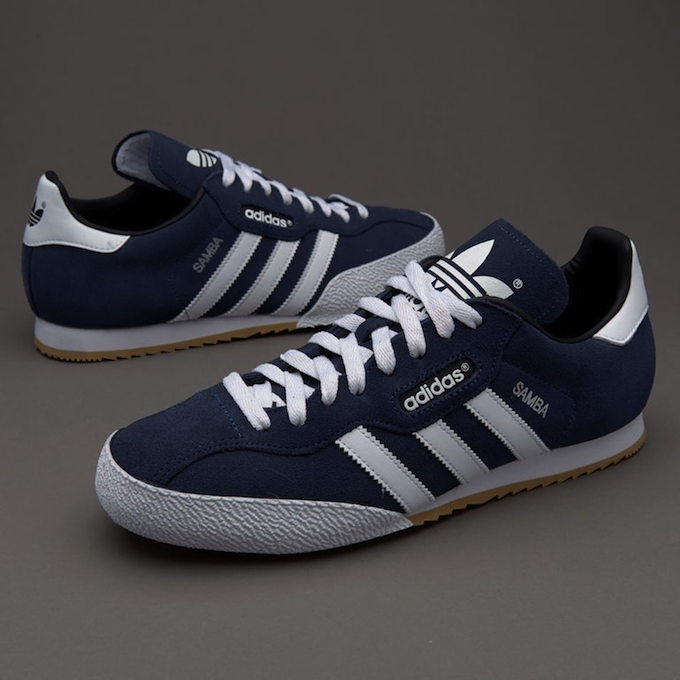 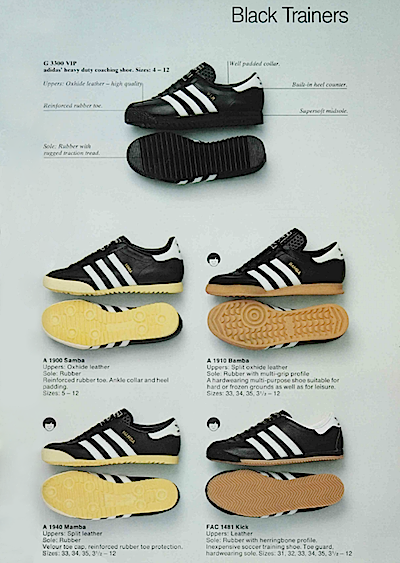 The “Samba” football shoe was a popular choice for hard or icy pitches, but also for wearing indoors. 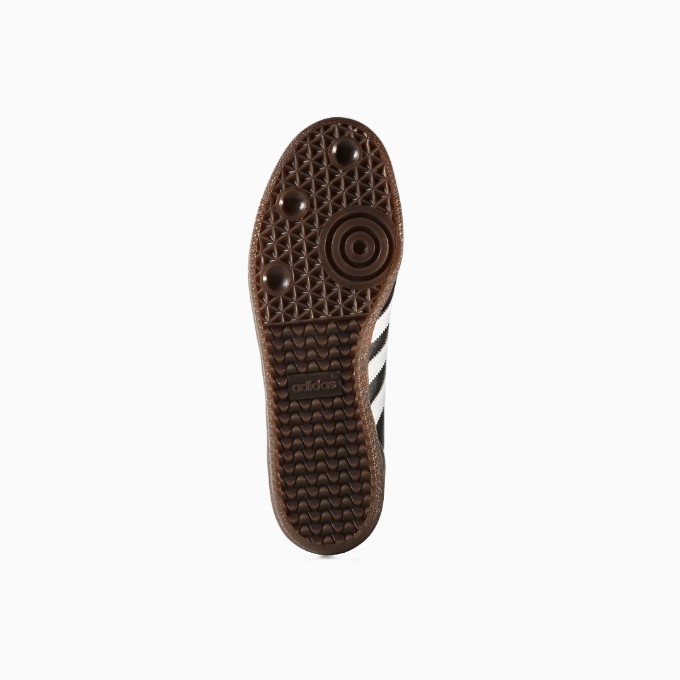 This particular shoe with article no. 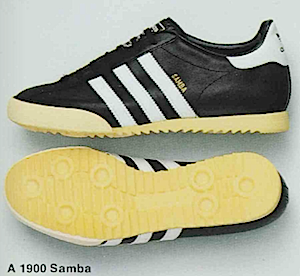 139 (190 for US and UK market) was made in Germany. 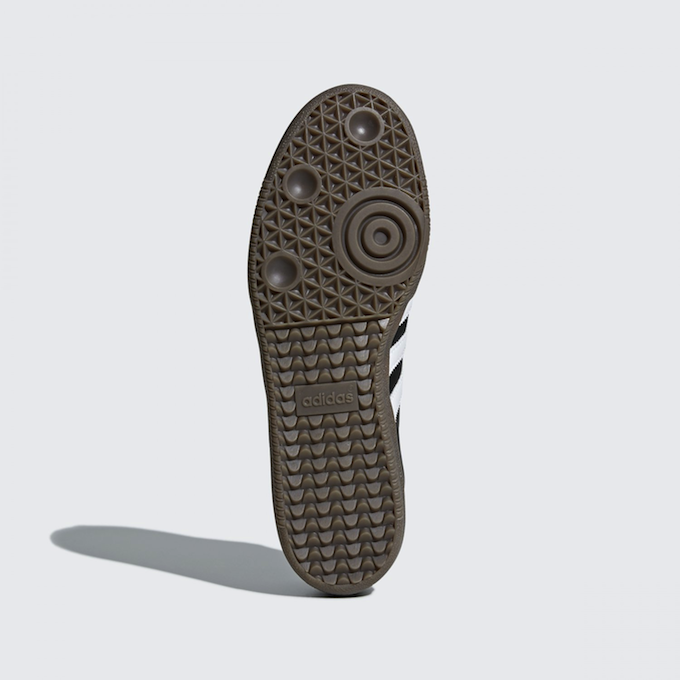 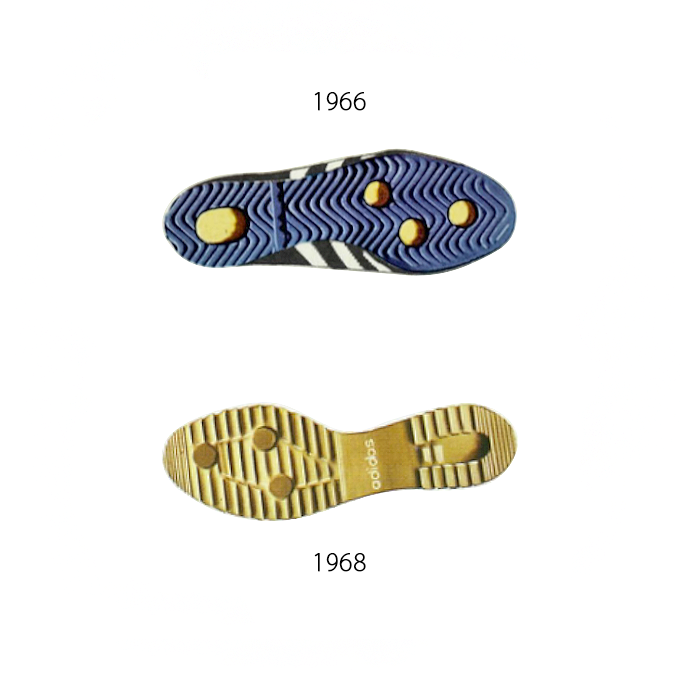 The shoe is designed for hard and smooth surfaces. 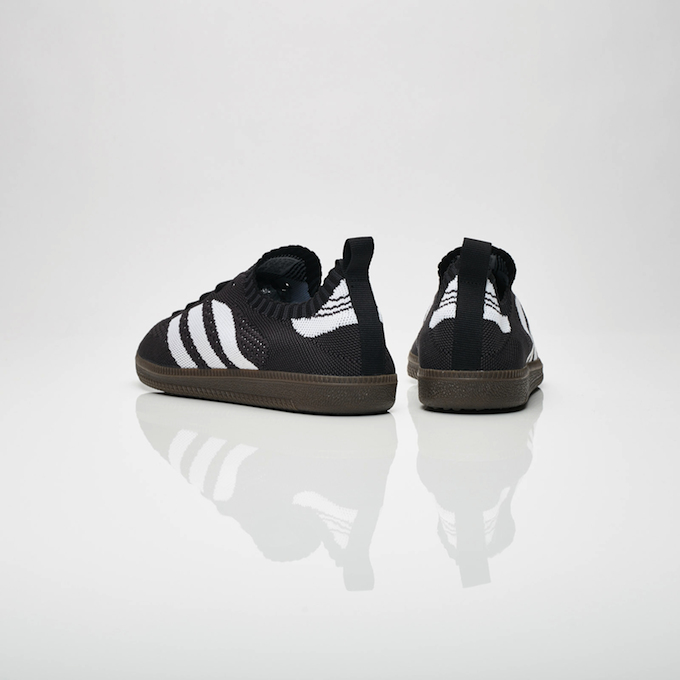 It can be worn both outdoors and indoors. 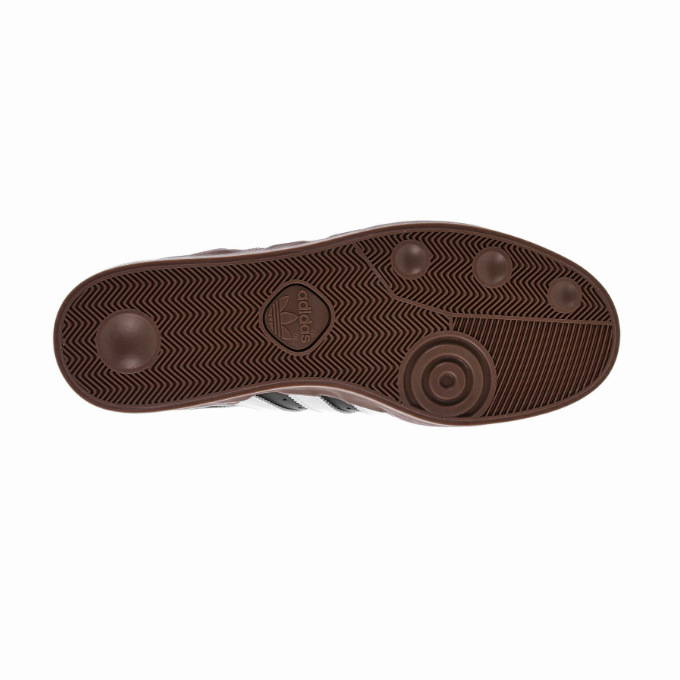 The upper is made of black, specially tanned cow hide (water-repellent). 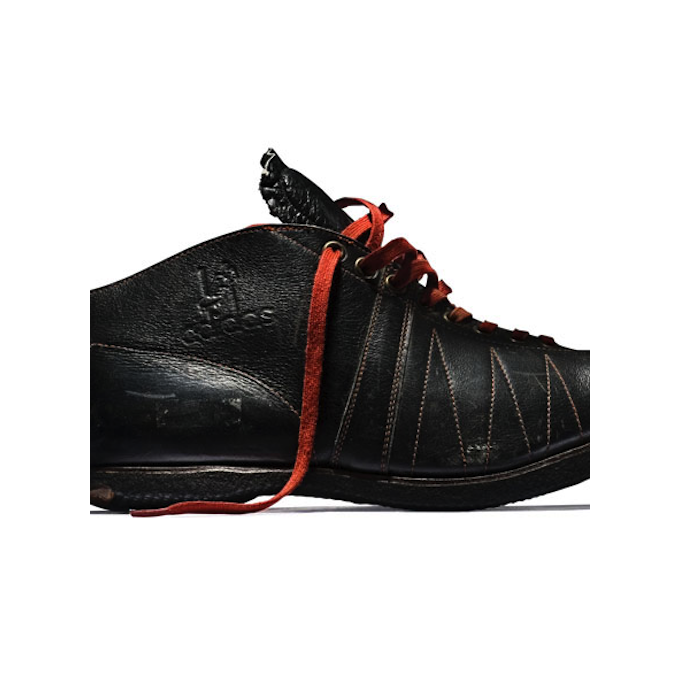 The back lining is made of calf leather. 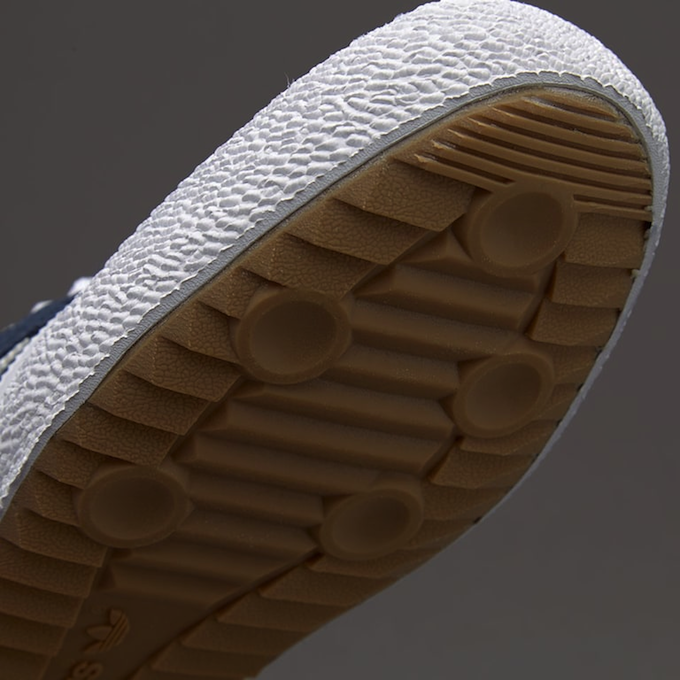 The inlay sole is made of calf leather backed with 3mm foam. 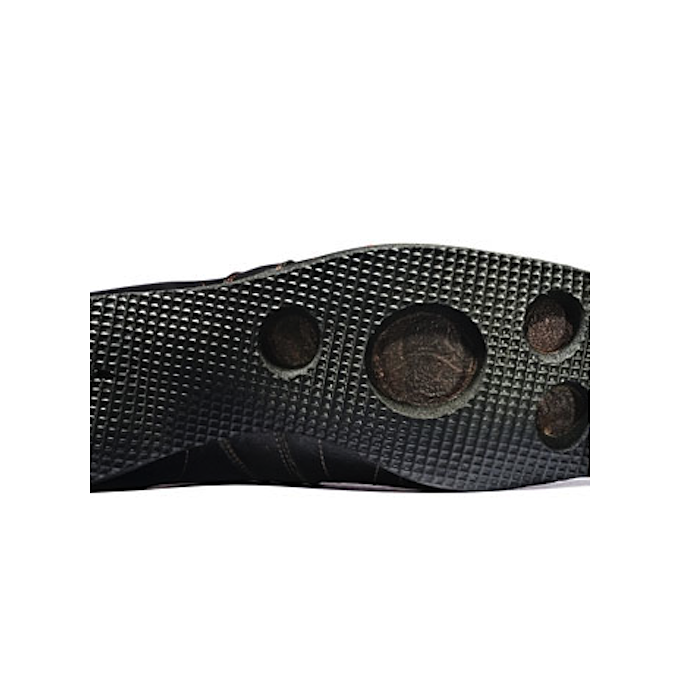 The insole is made of chrome splits. 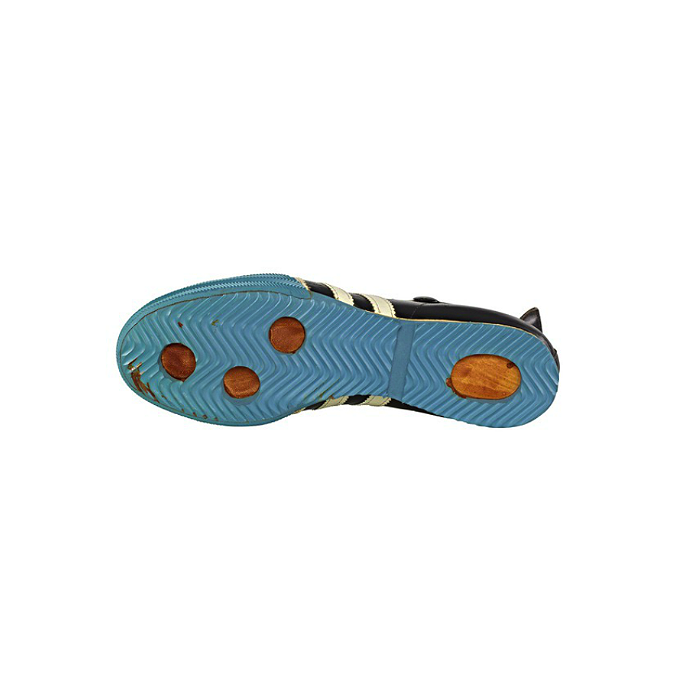 The heel wedge is made of beige 7mm cellular rubber, the outsole of blue 10mm cellular rubber. 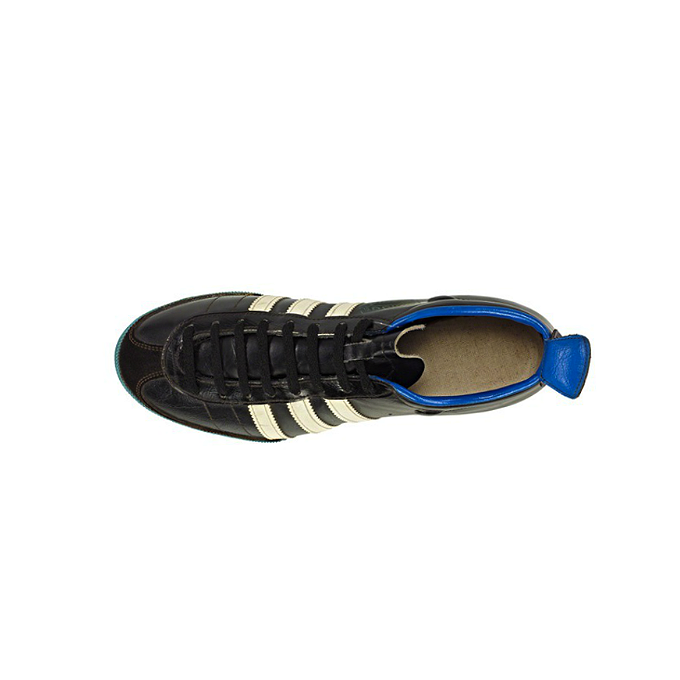 The toe protector is made of compact blue 2mm rubber. 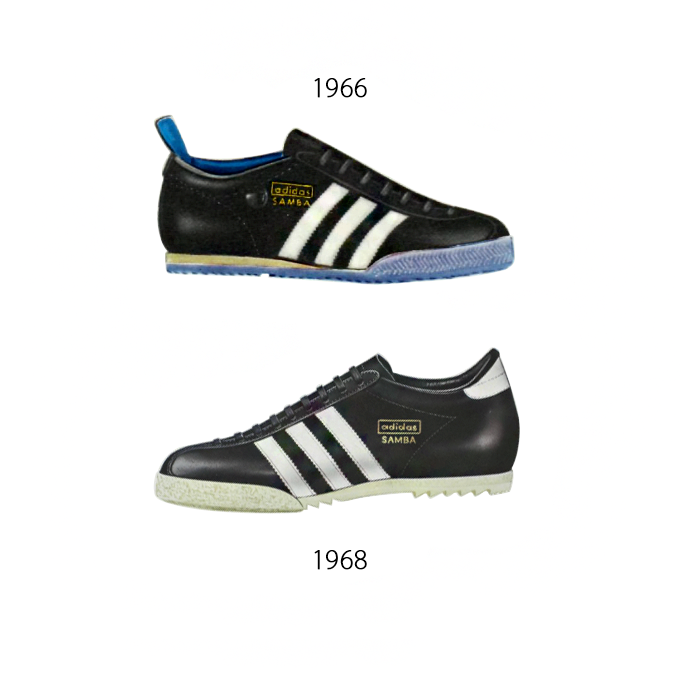 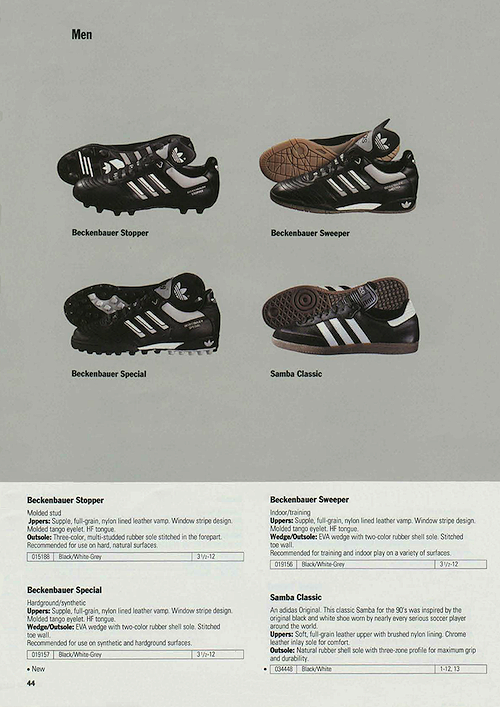 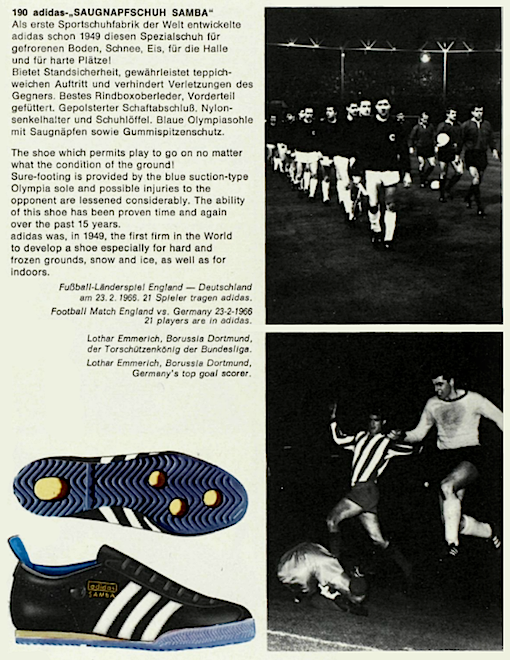 Als erste Sportschuhfabrik der Welt entwickelte adidas schon 1949 diesen Spezialschuh für gefrorenen Boden, Schnee, Eis, für die Halle und für harte Plätze! 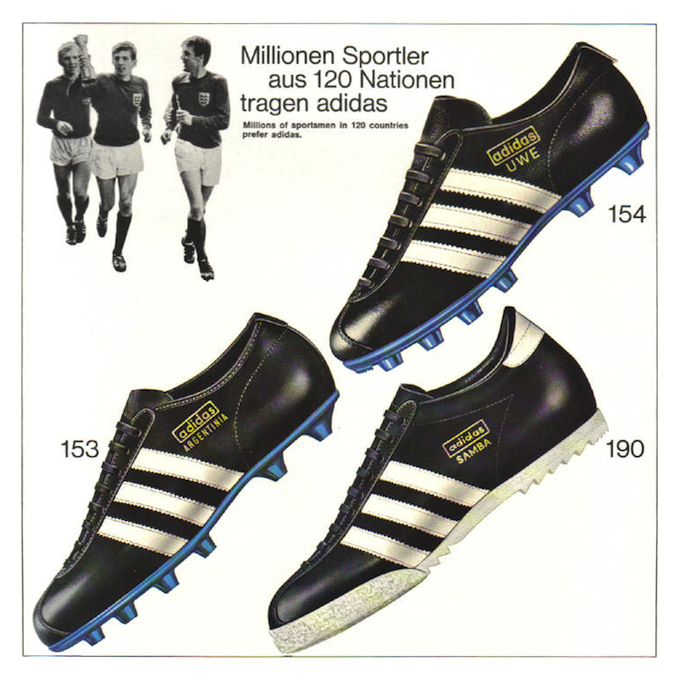 Millionen Sportler aus 120 Nationen tragen adidas. 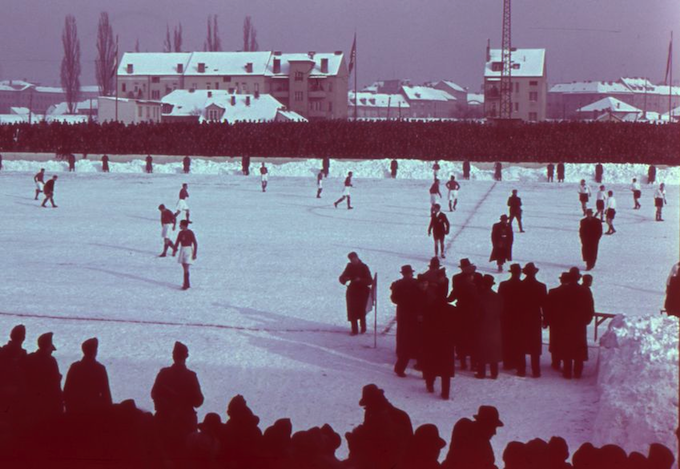 Spezialmodell für gefrorenen Boden, Schnee, Eis und für die Halle sowie für harte Plätze! 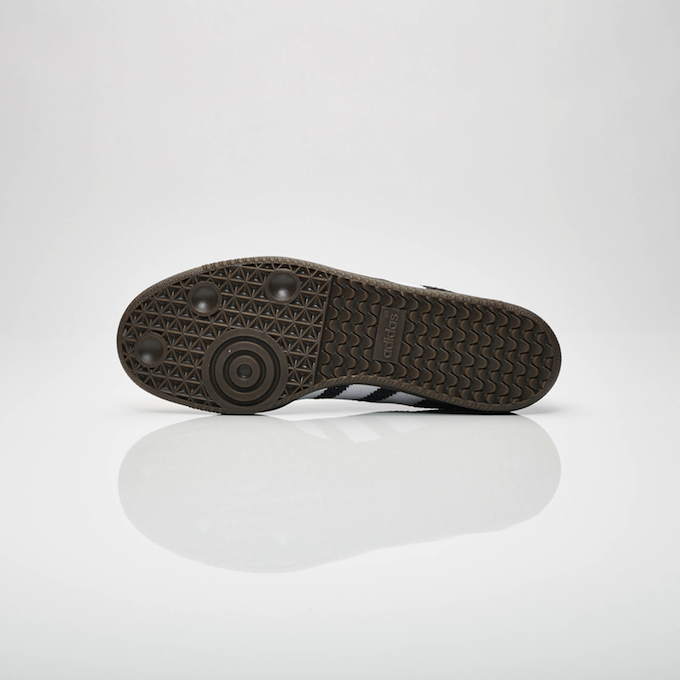 Bietet Standsicherheit und gewährleistet teppichweichen Auftritt. 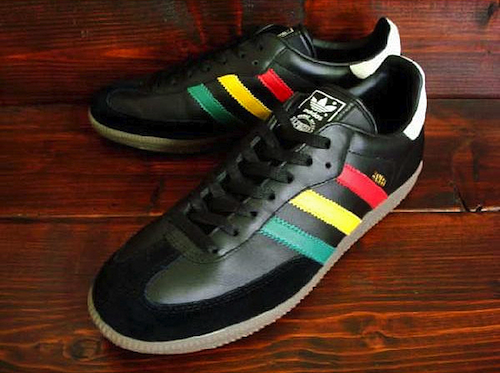 Bestes Rindboxoberleder.  Gepolsterter Schaftabschluß mit der neuen Fersenpolsterung. 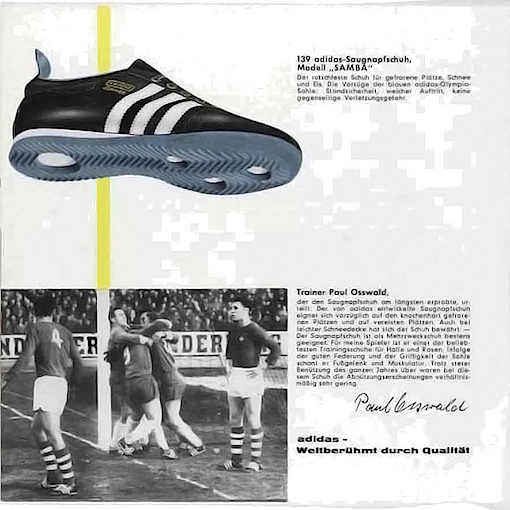 (DBGM geschützt). 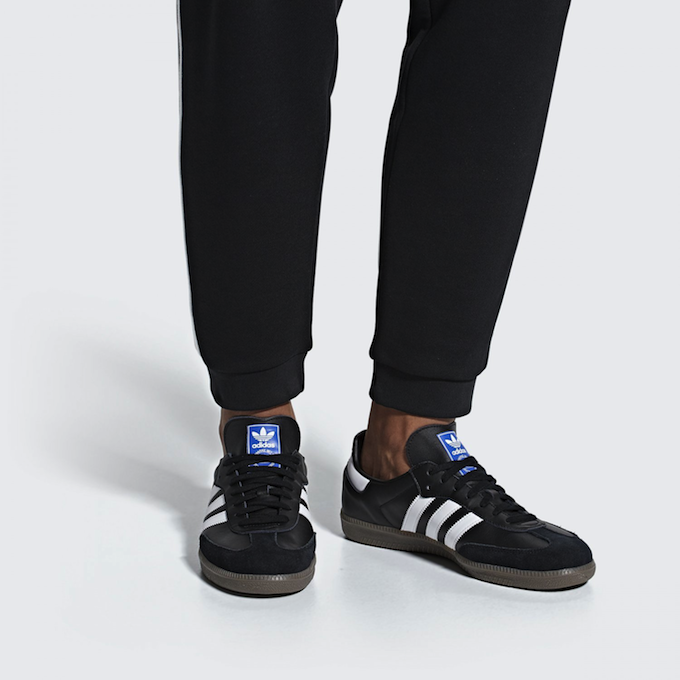 Neue adidas-Sägeprofilsohle mit Saugnäpfen sowie Gummispitzenschutz. 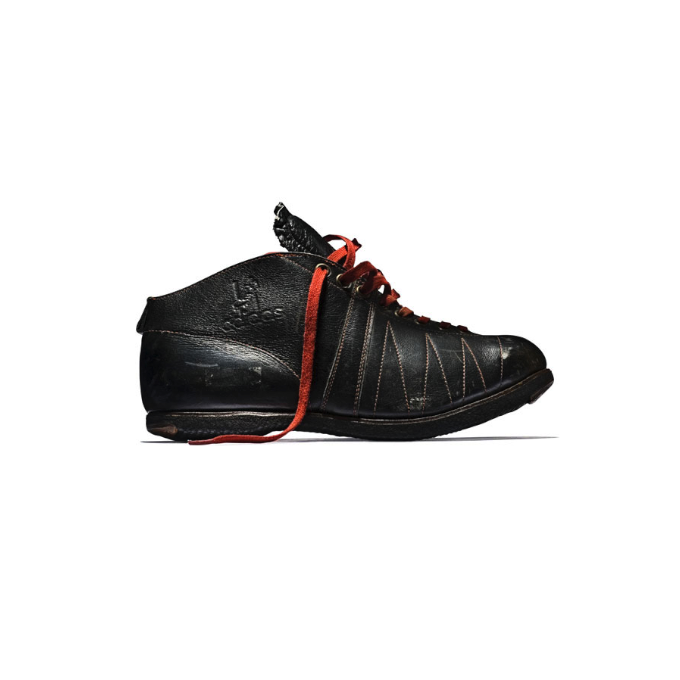 The shoe which permits play to go on no matter what the condition of the ground! 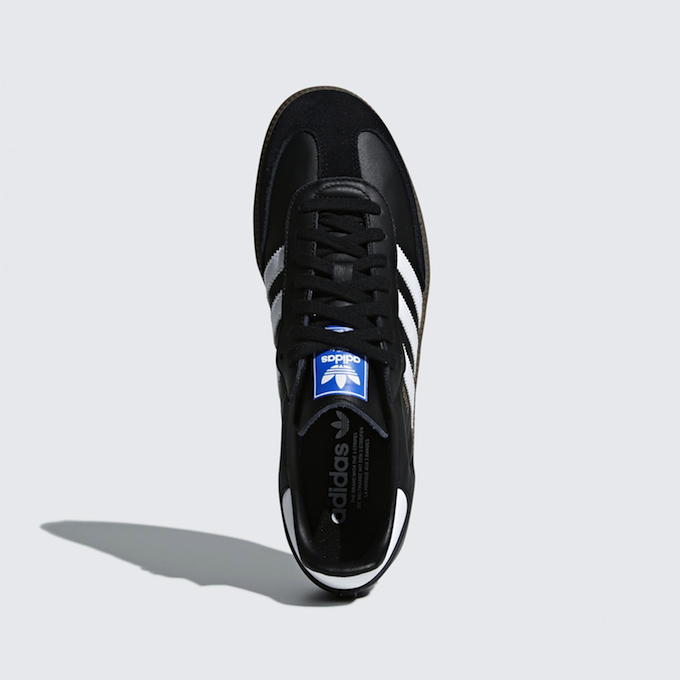 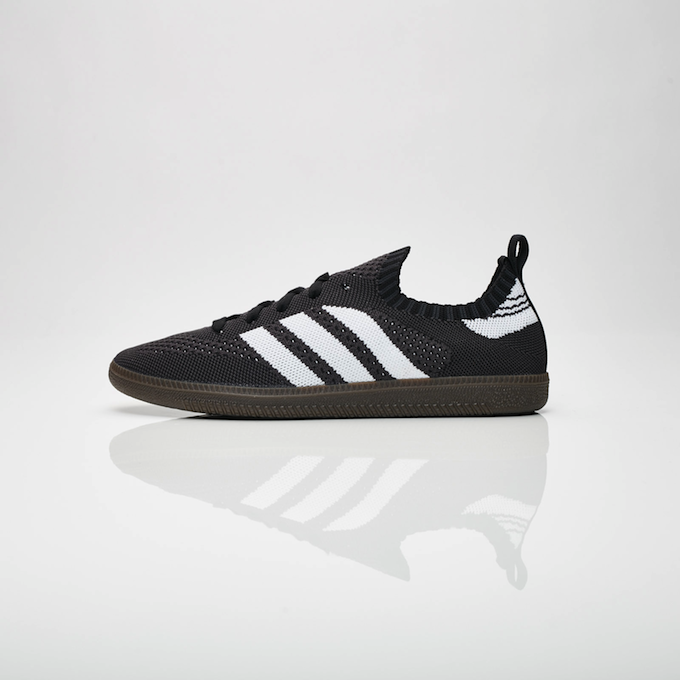 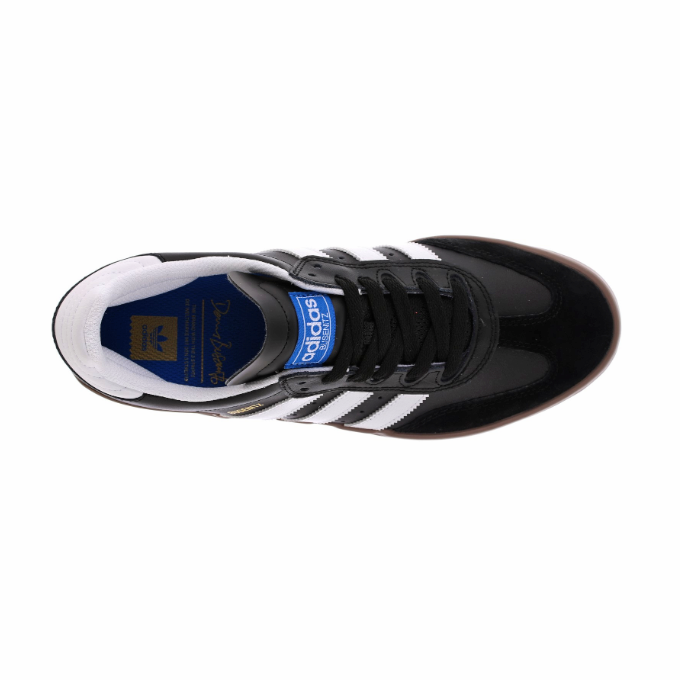 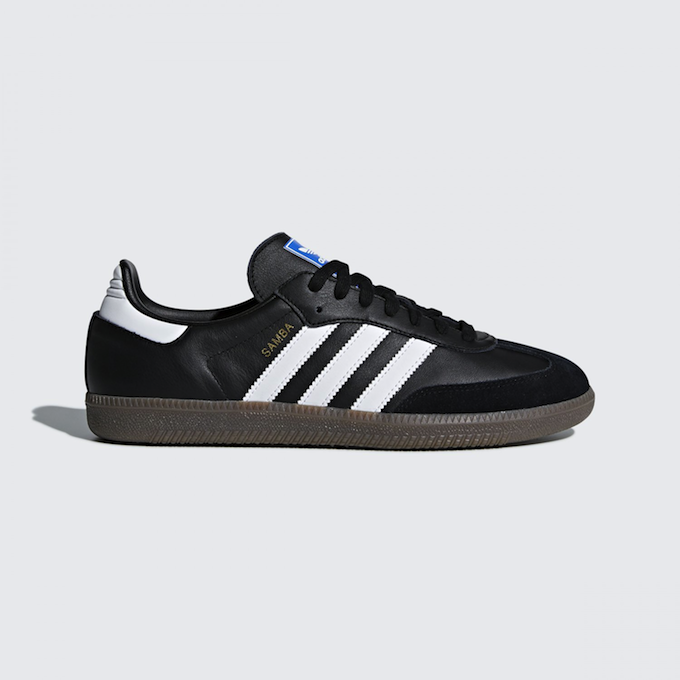 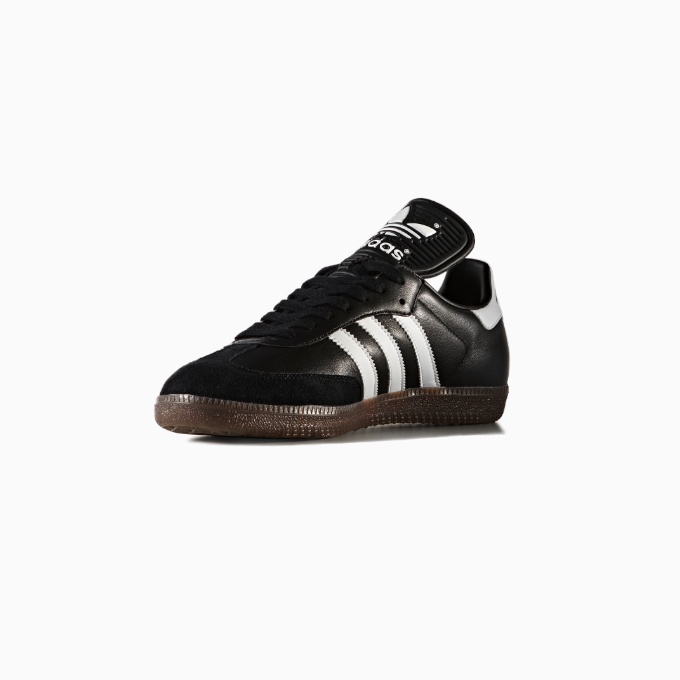 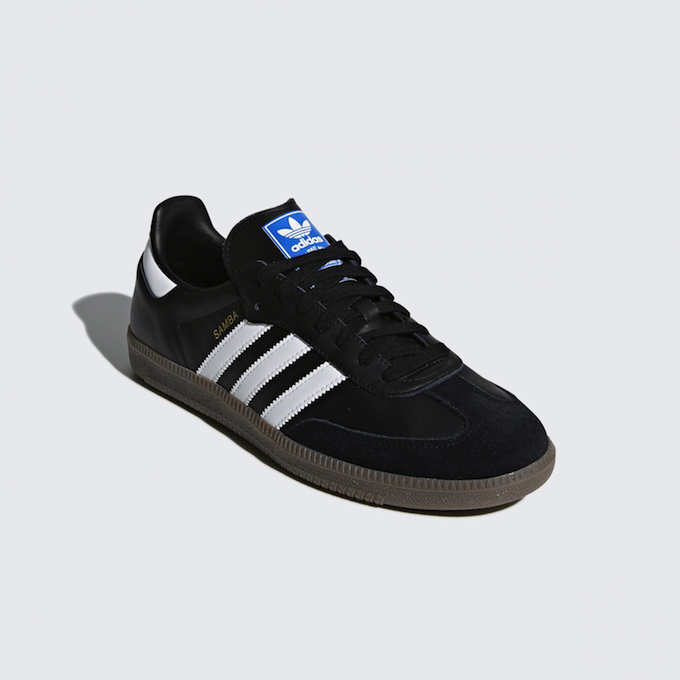 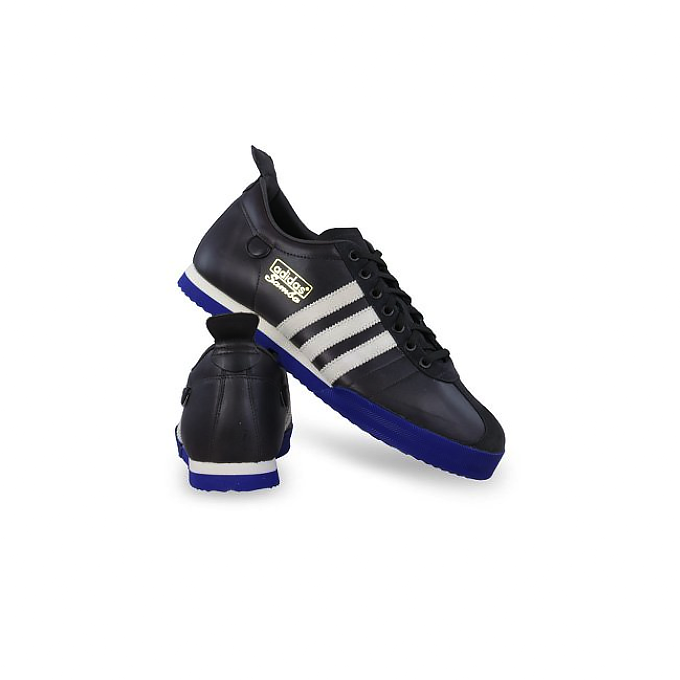 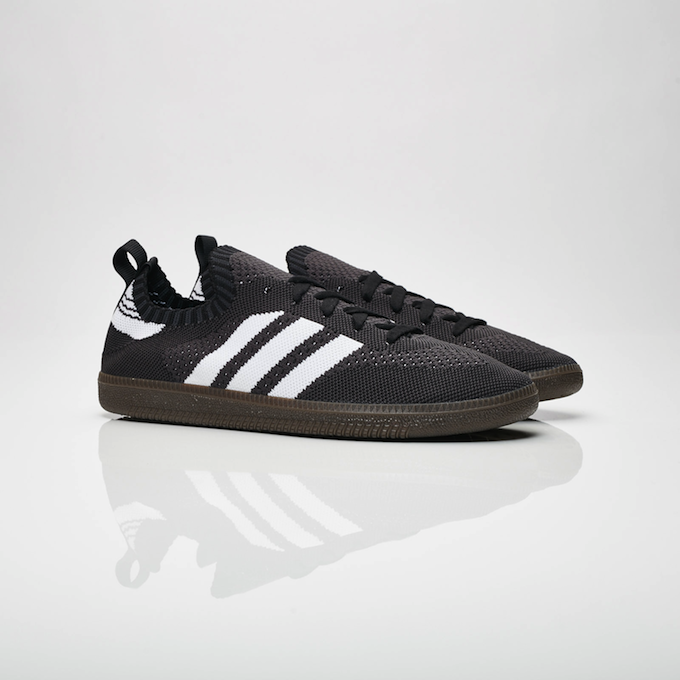 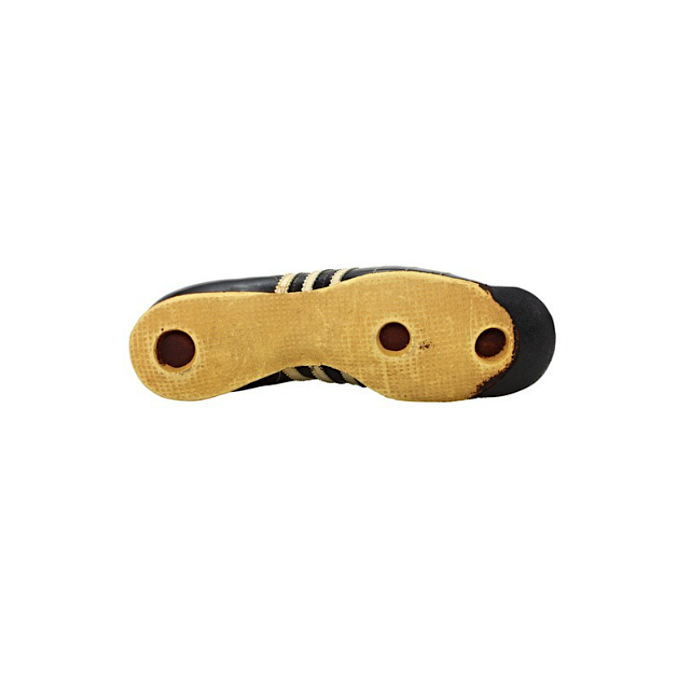 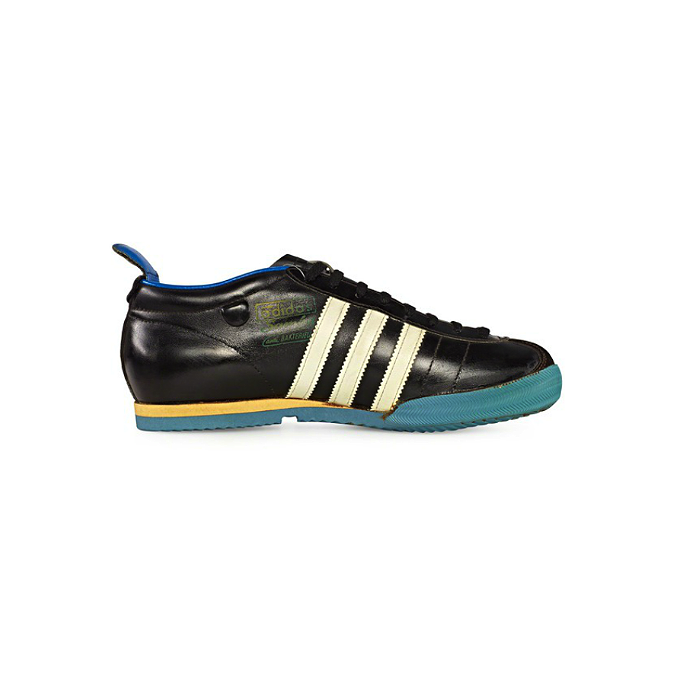 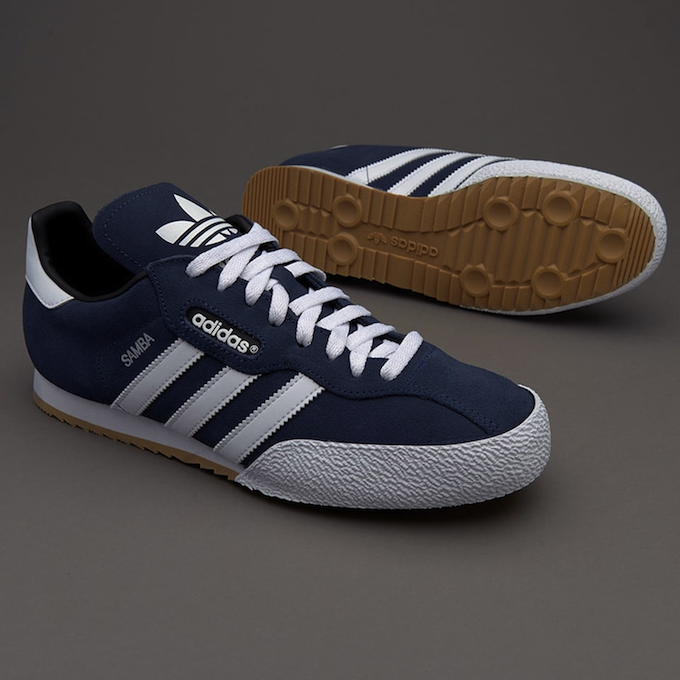 Sure-footing is provided by the new adidas-ripple sole and possible injures to the opponent are lessened considerably. 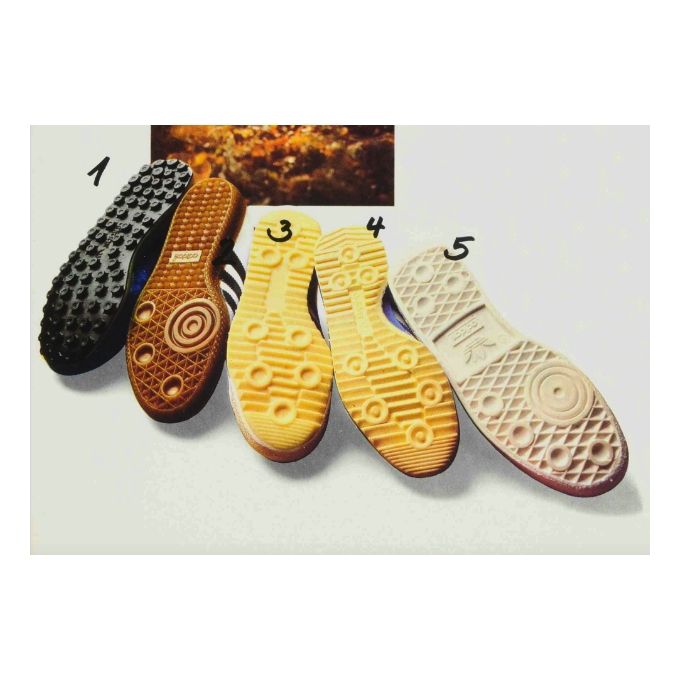 A shoe especially for hard and frozen grounds, snow and ice, as well as for indoors. 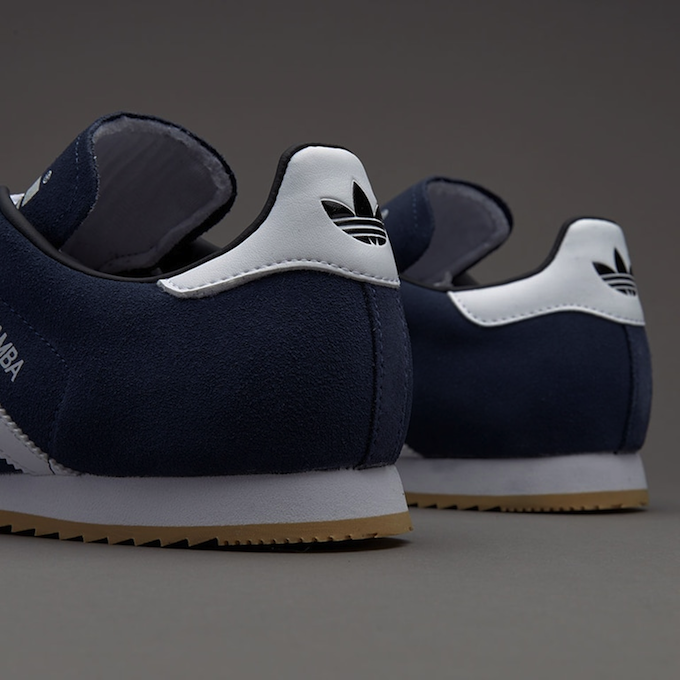 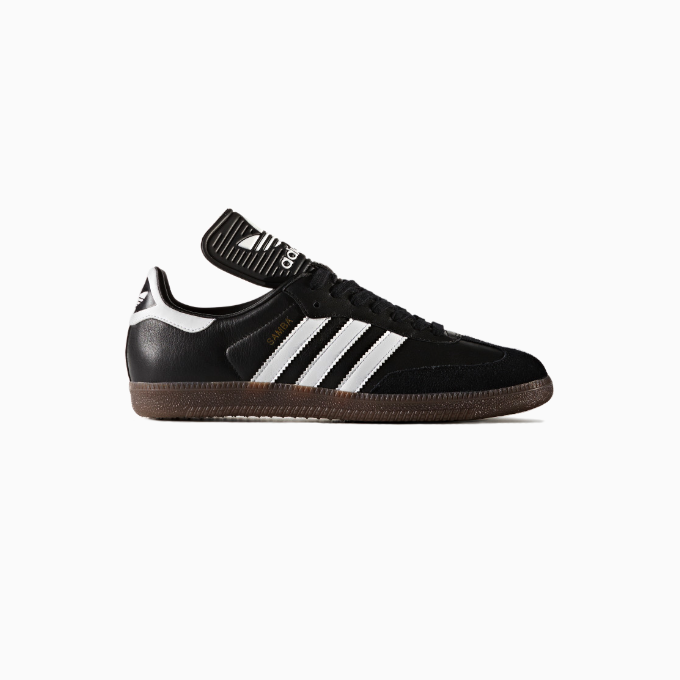 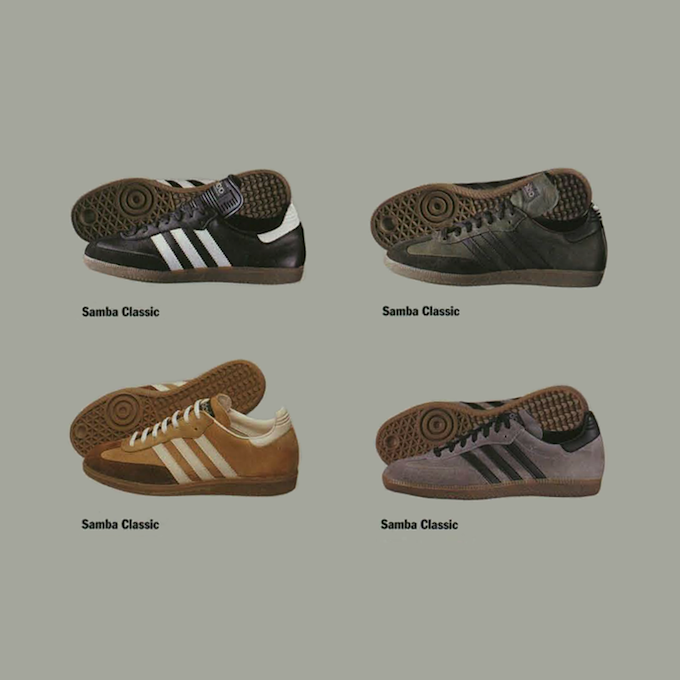 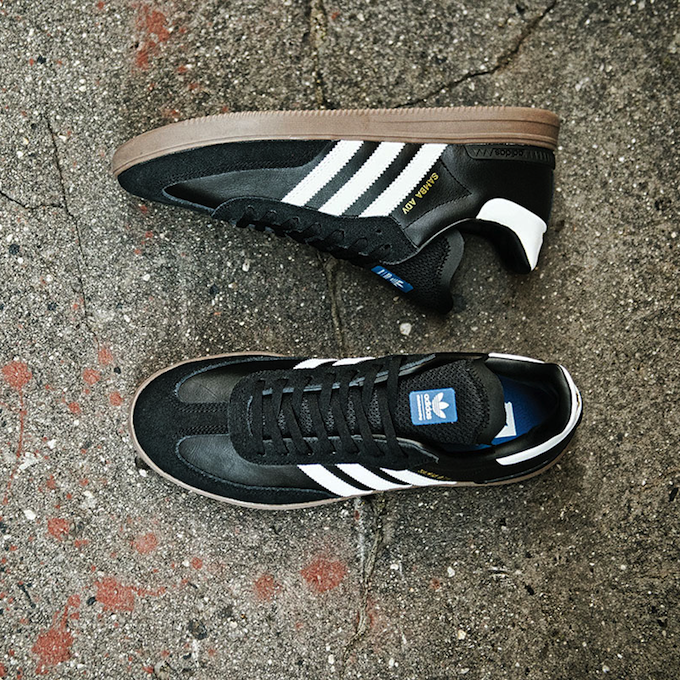 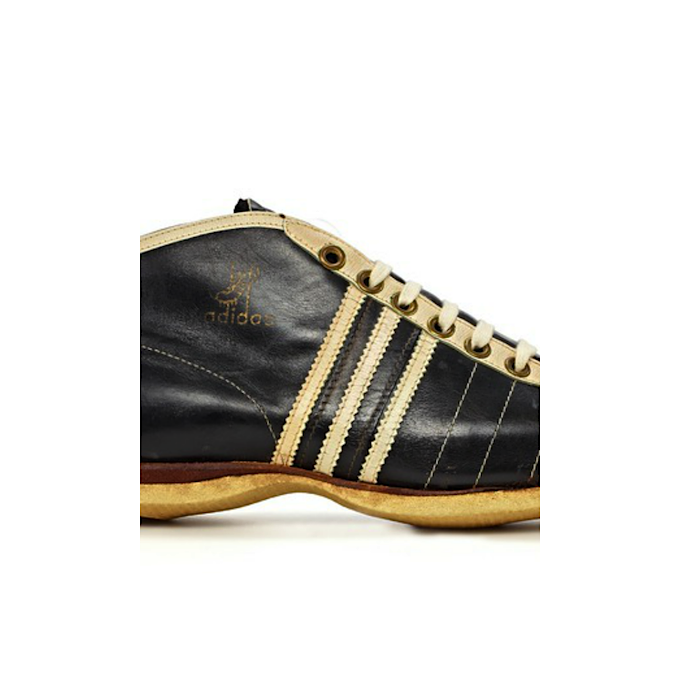 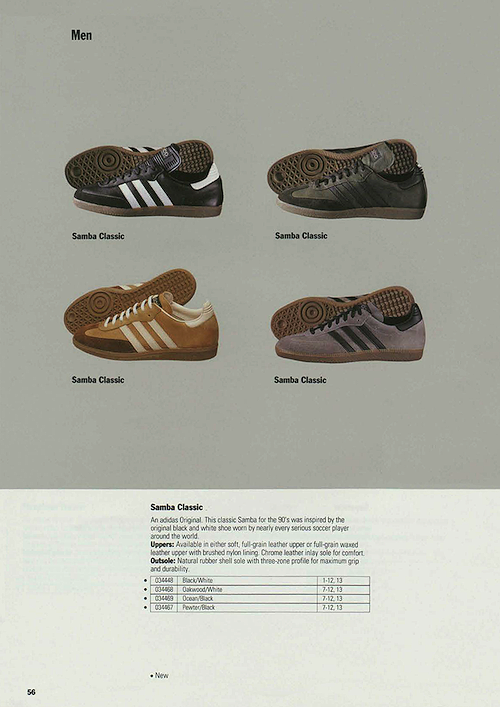 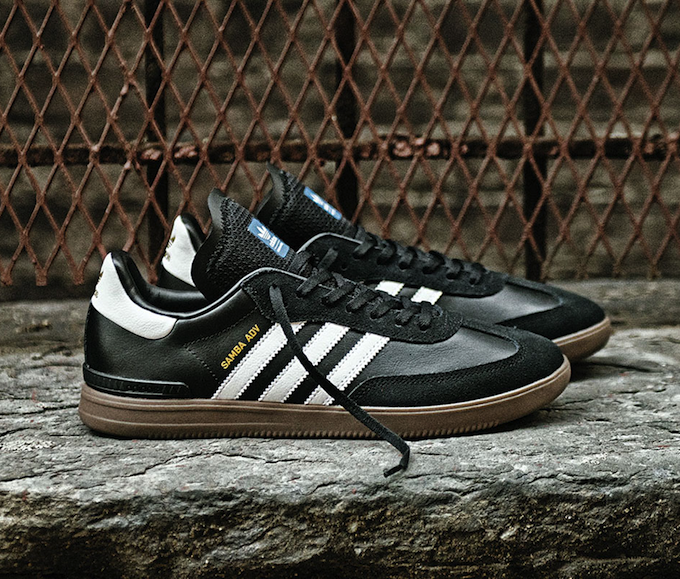 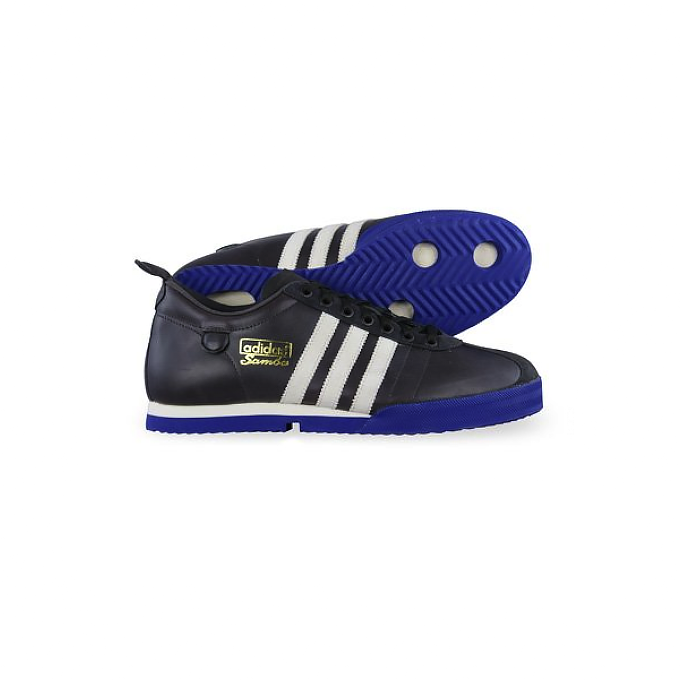 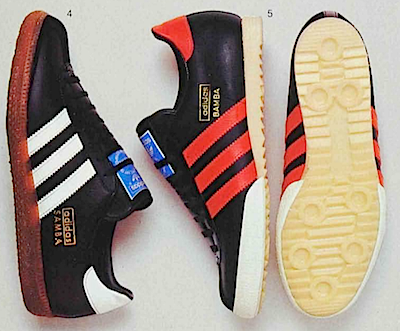 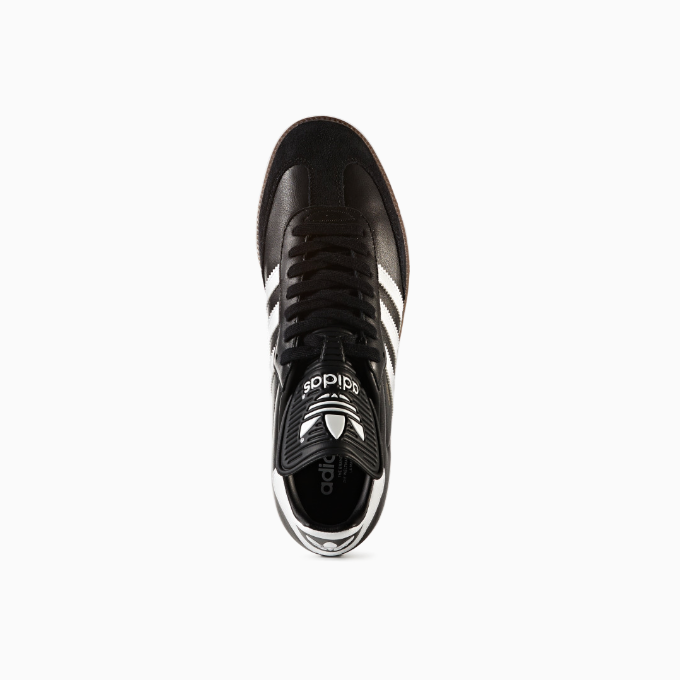 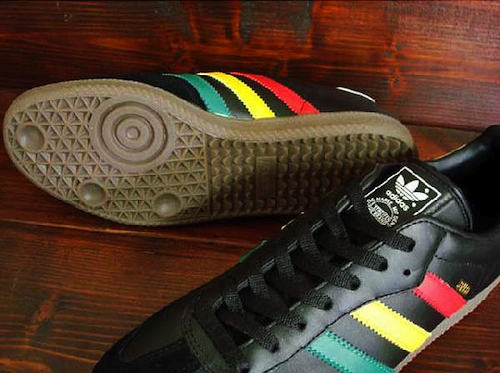 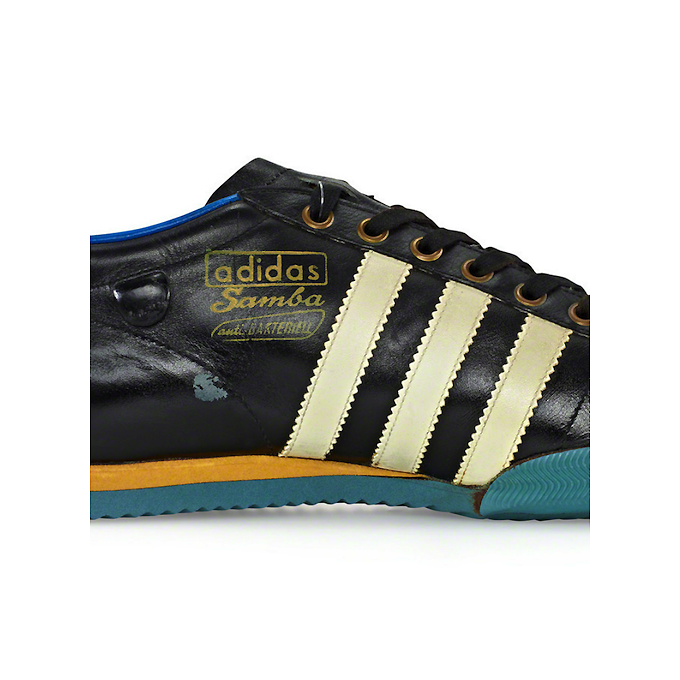 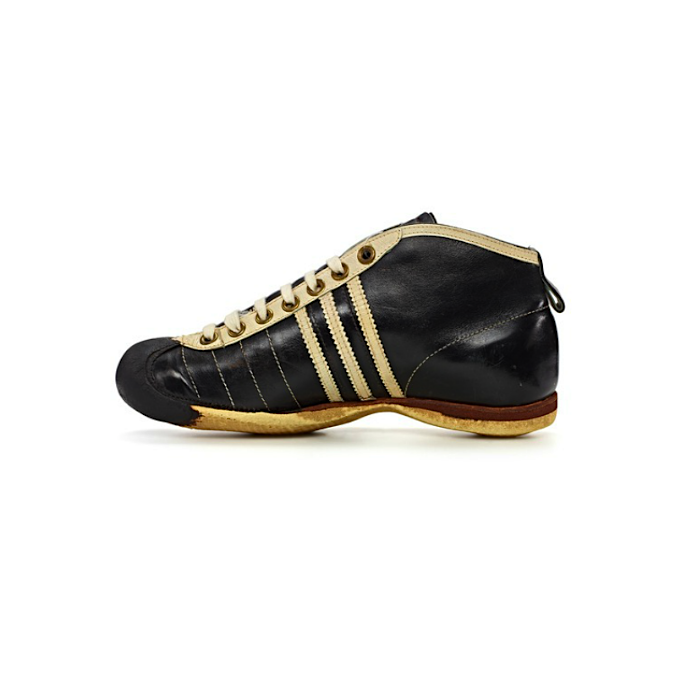 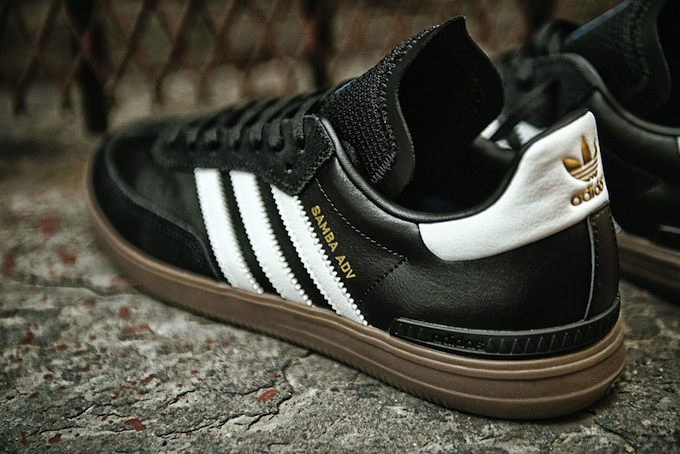 Made of the finest oxhide and featuring all the adidas qualities. 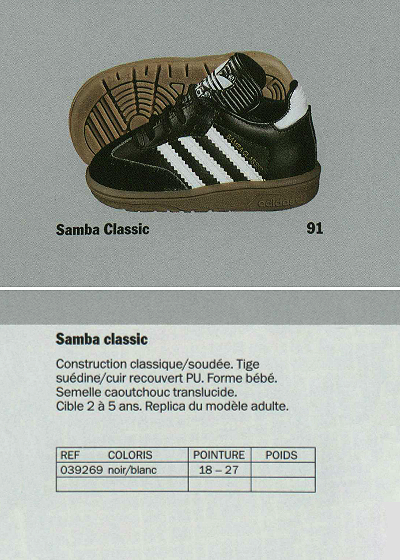 Construction classique / soudée. 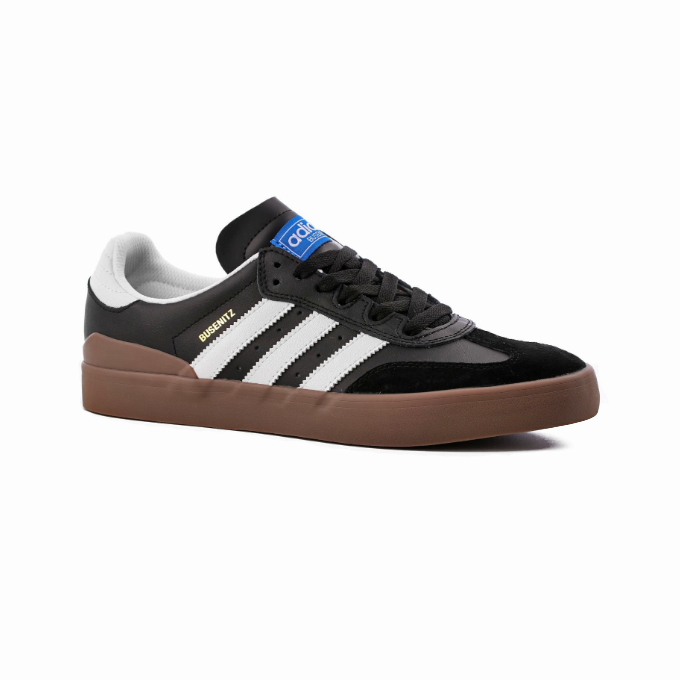 Tige suédine / cuir recouvert PU. 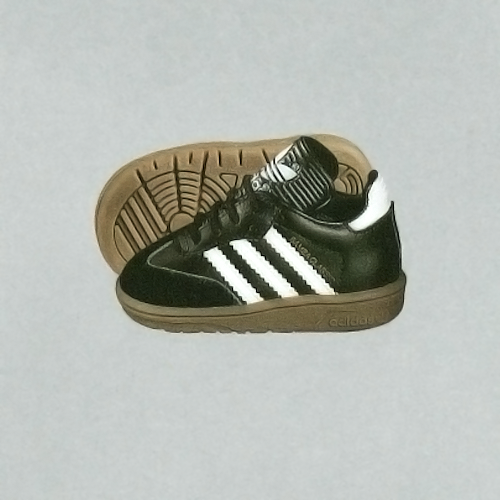 Forme bébé. 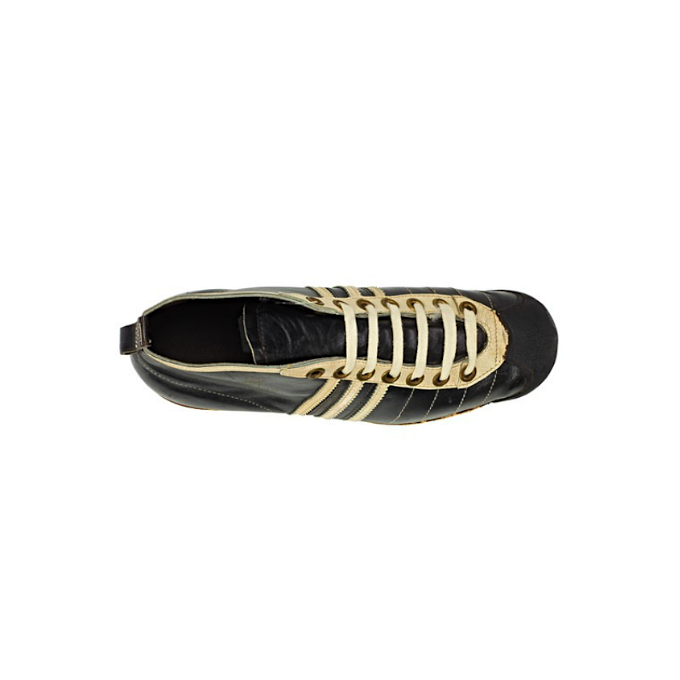 Semelle caoutchouc translucide. 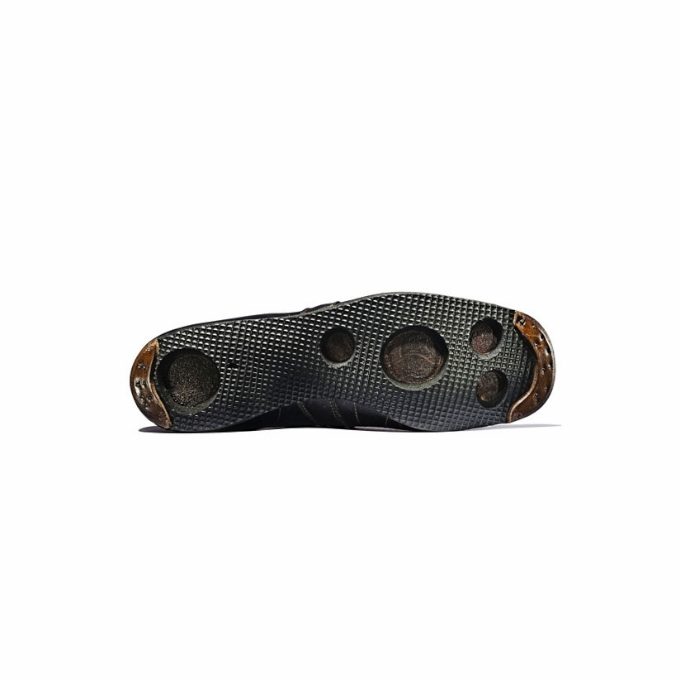 Cible 2 à 5 ans. 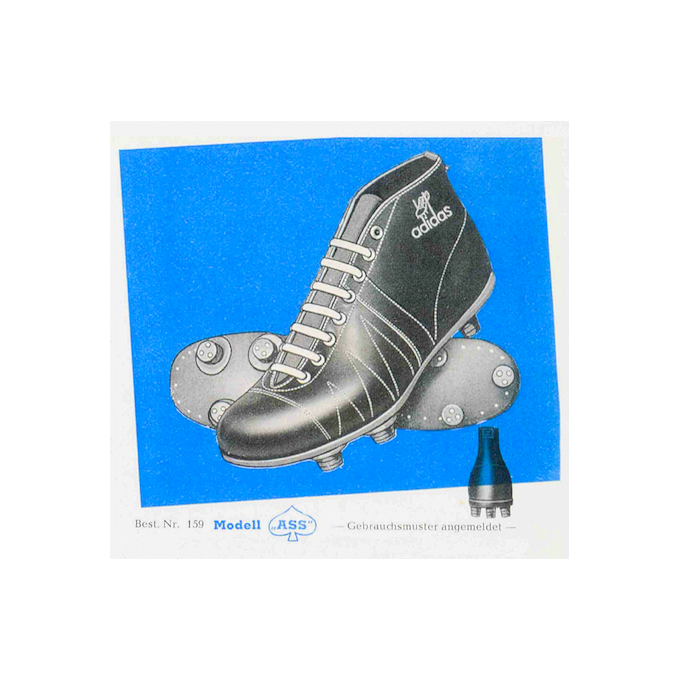 Replica du modèle adulte.